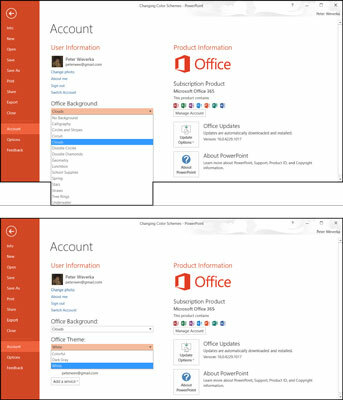 Starting on the Accounts screen, you can change the screen background and Office 2016 theme. The screen background is the fluff that appears along the top of Office application windows. The Office theme is the color (or lack thereof) that appears around the perimeter of Office application windows. You are encouraged to experiment with screen backgrounds and Office themes until you find a combination that works for you. On the File tab, choose Account. You see the Account screen, as shown here. Changing the screen background (top) and Office theme (bottom). Open the Office Background drop-down list and choose an option. Open the Office Theme drop-down menu and choose an option. How do you like your new get-up? If you don’t like it, repeat these steps until you get it right. A screen background and Office theme you apply in one Office program applies to all the other programs as well.